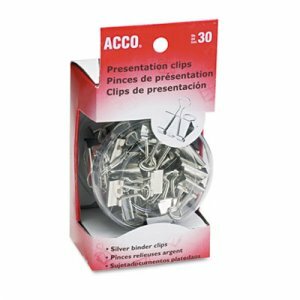 Silver-finish presentation clips created with four-step coating process are durable and provide a polished, professional look. Tempered steel makes clips ideal for long-term use. Uniform, non-slip grip will not weaken over time. With extra-strong hold, these clips spring back to original shape when removed. Assorted sizes; largest holds up to 110 sheets. Includes 12 mini, 12 small, 6 medium.